Make your own party decorations for Easter, or any other occasion. Spruce up the yard with some outside Easter decorations that celebrate the springtime holiday. Decorating the yard for Easter is often an arduous task due to weather conditions. Spring is notorious for torrential rains, and in some areas of the country, a few snowflakes have even fallen around the Easter holiday. From muddy shoes to freezing fingers, getting the yard decorated is rarely a day in the sun for anyone. Check the extended weather forecast. Pick two days, not one, to set up decorations. This way, a back-up date is available for getting the yard decorated if rain, snow or wind interferes with the first date. Pick out sturdy yard decorations that will withstand the typical environment for your area in the spring. If you have frequent high winds, sturdy staked wooden cutouts may be better choices than lightweight banners and handmade floral wreaths. Wait until the day of the party to set up smaller, more delicate decorations like paper lanterns or homemade luminaries. Get as much help as possible. Recruit your family members to help get the task done quickly or take a friend or neighbor up on his/her offer to help with party preparations. Rake up any leaves that spent the winter packed under snow. This will allow the grass to get more sunlight, encouraging a spring green lawn. If the date of the party draws near and you find your yard still covered in six inches of snow, it may be time to think of fun ideas for Easter decorations that can be used indoors or outdoors. After all, no one wants to spend an Easter egg hunt wading through drifts, tromping through slush or slipping on ice, no matter how attractive the yard looks. Bunnies, eggs, chicks and flowers in pastel colors all represent spring and Easter. To get the most for your money and time, choose outside Easter decorations that are more representational of spring rather than Easter. This way, you can set them up well before your Easter party and leave them up until summer. Not only do you need to decorate the area for the party, but you should also think about picking up some fabric or plastic cloths to cover picnic tables and card tables that will be outside for party food and drinks. Light up the party area by hanging paper egg lanterns from trees or stringing them between lampposts. Aim a large holiday projector with stationary Easter slides at the side of a house, garage, shed or barn near the party for a great lighting addition. A less expensive option for lighting the yard is to make luminaries out of pastel or white bags, using a flower or bunny stencil, sand and candles. Create a scene in your garden, around a large rock, your mailbox or anywhere that is somewhat out of the way. Scatter outdoor decorated eggs around a small garden wagon filled with spring flowers. Set up a medium-sized statue of a bunny holding an Easter basket or add some small wooden chicks near the eggs. Your scene can be anything that reflects the spring season or Easter holiday. Get ready for an Easter celebration by adding some outside Easter decorations to your yard. 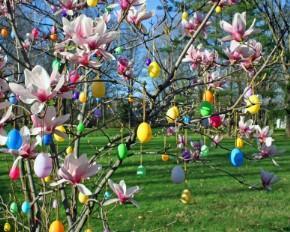 It will make egg hunting festive and lift guests' spirits to see the cheerful signs that spring is around the corner.